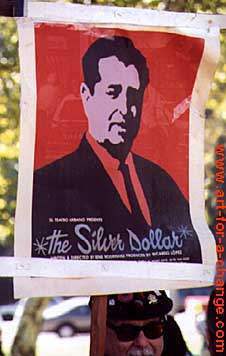 A Poster of Ruben Salazar carried through the streets of Highland Park during the Chicano Moratorium 2002 Protest. Chicano/Mexicano people suffered at the hands of the LAPD (which was almost all White during 1970). During the Moratorium, Mr. Salazar stopped into the "Silver Dollar Cafe" on Whittier Blvd. The Police arrived on the scene and fired a Tear Gas Canister into the Cafe. The 9 inch long Canister, which was designed to penetrate walls, passed through Salazar's head, killing him instantly. Many activists in the community saw the killing as a deliberate Police murder. A state investigation later found the killing to be an "accident." To this day Ruben Salazar is regarded as a hero in the Chicano/Mexicano community. In my photograph, a marcher is carrying a Portrait Poster of Salazar created by the famous Chicano Artist, Rupert Garcia.